The finish between Hazard and Steele on Day One, photograph by Damian Devine. 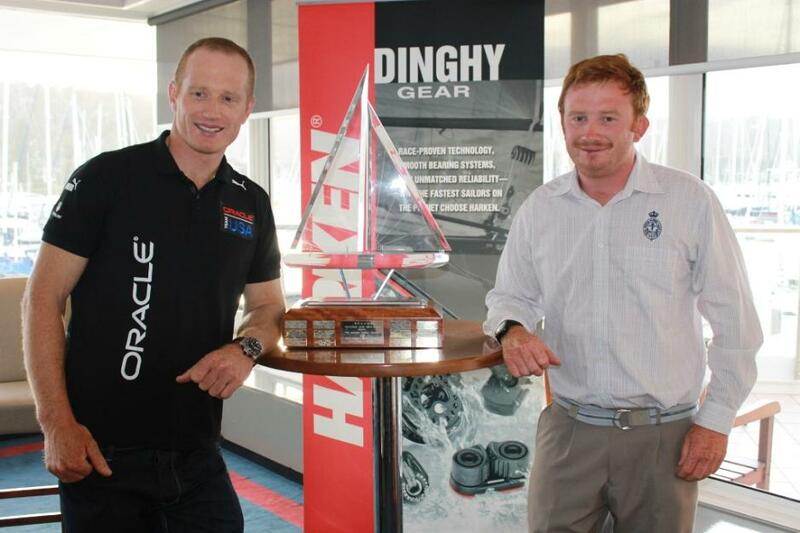 James Spithill, one of the Royal Prince Alfred Yacht Club’s favourite sons and defending America’s Cup winning skipper returned to Australia especially to be the ambassador for the 20th annual HARKEN International Youth Match Racing Championships, hosted by the RPAYC from Tuesday 20 November until Sunday 25 November. A dual winner of this prestigious event, Spithill was guest speaker at the opening ceremony on Wednesday to welcome the competitors and gave an inspiring talk about his history with the Harken and the doorways it opened for him. He also mentored a couple of training clinics for the teams on the club’s fleet of Force 24s. "The HARKEN" as it is known in youth sailing circles worldwide stands out as one of the premier events for youth on the international match racing calendar and has during its 20 year history served as a launch pad for a number of local yachting stars including dual winning skippers James Spithill, Michael Dunstan, Seve Jarvin and more recently Torvar Mirsky. Other teams are from the host club The Royal Prince Alfred Yacht Club, Royal Sydney Yacht Squadron, Royal Freshwater Bay Yacht Club, Royal Port Nicholson Yacht Club and Gosford Sailing Club. This year there are three female skippers in Stephanie Doyle and Milly Bennett both from the RPAYC and the third with an all female crew from Royal New Zealand skippered by Claudia Pierce. The 2012 Harken International event is certified Grade 3 for ISAF match race rankings. After a team weigh-in, training and opening ceremony on Wednesday, match racing commenced on Pittwater on Thursday and will conclude with the finals today, Sunday 25 November. The course is the standard match racing windward/leeward set up and racing will take place in the big pond just north of Scotland Island. The regatta is being sailed in the RPAYC's fleet of Force 24' yachts which are purpose built for match racing. Each team can have up to five crew with a maximum crew weight limit of 350Kg, all of who must be under 21 years of age. Each team has been sailing two complete round robins with every team racing each other twice. The top four teams then battle it out in a series of semi finals and finals with the final being the best of five final to decide the winner. Race Officer for the event is Ted Anderson whose experience goes back to the Olympic match racing in 2000 and Chief Umpire is Phil Mostyn who leads a formidable cast of umpires with national and international experience. Teams have been billeted with RPAYC Club members, a custom that has forged many longstanding friendships in past years. The organisation of an event of this calibre would not be possible without the aid of a dedicated team of volunteers and RPAYC members. One of the premier events for youth on the match racing circuit, the 2012 HARKEN International Youth Match Racing Championship marks the 15th consecutive year with HARKEN Australia as naming rights sponsor and is one of the longest standing regatta partnerships in the world. Their ongoing commitment to the development of youth match racing is a credit to the Northern Beaches leading manufacturer and marketer of quality sailboat hardware and accessories. Defending Harken international youth match racing champion Dave Hazard and Chris Steele both representing the Royal New Zealand Yacht Squadron will battle it out in an all Kiwi final today after convincing wins in their semi finals in the 20th Harken International Youth Match racing championships on Pittwater yesterday. Their wins guarantee the coveted Rockin’ Robin Trophy will go back to New Zealand for the fourth consecutive year. Hazard defeated Claudia Pierce, also from the RNZYS 2-0 in their semi final, winning both matches comfortably. The only incident in their semi was that both misjudged the start to be called OCS by RO Ted Anderson in their second race. Hazard showed why he is the highest ranked match racer in the competition and the defending champion after some smart racing today and should go into tomorrow’s final a slight favourite. Pierce, on other hand, with her all female crew and in her first regatta has had a good week sailing with her crew working well and gaining some invaluable experience. She had no expectations coming into the regatta she can ensure the Kiwis from the one Auckland club fill the podium if she wins tomorrow’s petit final. In the other semi final, it was a win to Chris Steele, the second highest ranked competitor with a 2-0 victory over WA’s Sam Gilmour, representing the Royal Freshwater Bay Yacht Club. The first match was fairly tight with Steele leading all the way to win by a couple of boat lengths. In the second, whilst neither gained the ascendency in the pre start, it was Gilmour who was first over the start line to lead on the first beat to the top mark, but Steele soon took the lead to win comfortably in the end. Gilmour will meet Pierce in today’s three match petit final whilst the final between Hazard and Steele will be the best of five with racing scheduled to commence at 1100hrs. Conditions are forecast to be 8-13 knot North Easterly for the final day of competition. Also sailed on Saturday were the consolation fifth to tenth placings round robin with competitors carrying their points from the first round robin into stage two as the six remaining competitors sailed each other once with the highest points deciding the placings. Overall there were five flights scheduled for this stage of the competition. Leading going into stage two were Sam McKenzie from Royal Port Nicholson Yacht Club and Stephanie Doyle from the host club the RPAYC who began the round robin on four points. Milly Bennett, RPAYC and Sam Ellis, Gosford Sailing Club were on the next rung on three points whilst Jaidan Stevens, RSYS and Liam Bennett, RPAYC on equal two points. McKenzie won all his five races to finish in fifth whilst Doyle won three and lost two to McKenzie and Sam Ellis. She finished sixth with Ellis in seventh one point behind. Milly Bennett and Jaidan Stevens both had two wins today to finish eighth and ninth respectively with Milly’s brother Liam finishing in tenth position. * Robyn Wiltshire presented the Royal Prince Alfred Yacht Club with a perpetual trophy named the ‘Rockin’-Robin Trophy’. Robyn presented the trophy in memory of her husband Grant and son Robert, Andrew Young & Jeff Smith, all Club members who tragically lost their lives at sea aboard the yacht ‘Rockin’ Robin’ whilst on passage to Fiji in 1990. Words and Photographs by Damian Devine. Copyright Royal Prince Alfred Yacht Club 2012, All Rights Reserved. 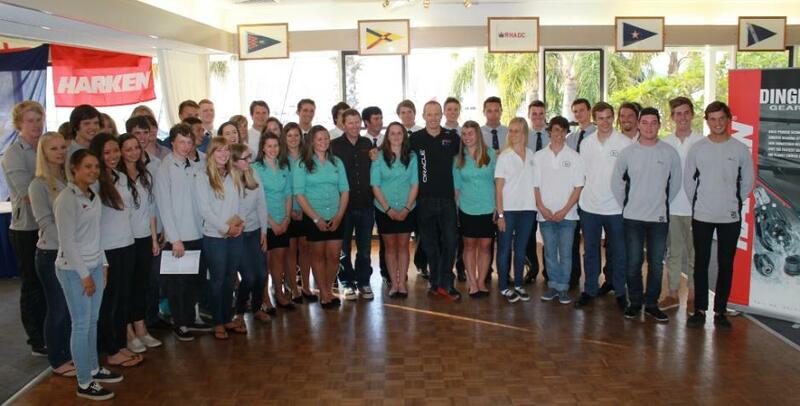 James Spithill with the teams who attended Wednesday's Welcome. Brothers James Spithill (1996 & 1998) and Tom Spithill (2008) who have won, along with sister Katie Spithill (1999) the Rockin' Robin Trophy. Katie is the only female to have won this event so far.